As the name gives away, this bread is fabulous! I was sent a bunch of different samples of Fabulous Flats bread to review. 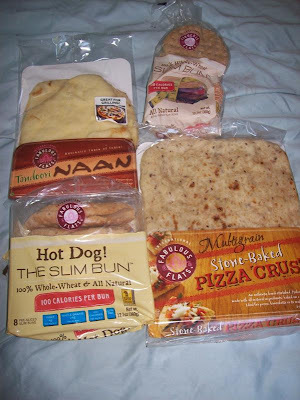 I got to try some hot dog buns, pizza crust, Naan, and flat buns. This brand uses no hydrogenated oils and no trans fats which is great and many of their products are whole wheat. First, my husband and I tried the hot dog slim bun to use for some Chicago style hot dogs. They were great. The next day, I actually started to use the hot dog buns as PB and J bread. I actually preferred it this way. They are 100% whole wheat, all natural, and only 100 calories. Yes! Next, we tried the garlic Naan. Wow this bread is tasty. We actually used it to make pizzas. We piled all of our toppings on it and baked it in the oven. The bread crisped up perfectly and tasted so yummy. I love garlic type breads and this one was no exception. This bread was so tasty for both the pizza and to eat plain! I loved all of the products so far that I have tried from this company. Thanks Fabulous Flats for sharing your awesome breads with me! I am your newest follower. I so love your blog and all your good information. I can't wait to read more. I hope you can follow back at http://mylifeadventurebyme.blogspot.com/2010/08/it-is-tuesday-and-it-is-time-for.html. Have a great day. A new follower. Thanks for the bread review. I use flat bread pretty much daily now, we don't seem to ever have regular bread in the house, prefer flat.